Vancouver-based Play Taxi Media has partnered with Elevator Strategy, Advertising and Design, Vancouver, and the BC Toyota Dealers to launch an integrated campaign across Play screens in Vancouver. Centered on showcasing Prius’ features and benefits while creating overall awareness of the Toyota Prius brand, the campaign components include extending to Vancouver riders the opportunity to use their (average) 15-minute cab ride to also enter to win a $200 gas card by engaging with the Toyota brand directly through the viewing of a customized Prius video and engaging with an interactive, educational quiz. With an advertising loop by Play Taxi of five minutes, chances are that riders will see the ad on the taxi screen in front of them an average of three times. Play has established itself as an effective medium for both national and regional clients with its ability to form a two-way dialogue with a consumer in a manner unrivaled by other advertising media. With Toyota, Play is able to provide an exciting alternative to the automotive industries often standard, traditional media buys by effectively delivering high impressions, measurement capabilities and reach through engaging and fun interactivity. The Toyota campaign is slated to run from Sept. 4 to Oct. 29 and uses the Play Vancouver network of more than 200 cabs in tandem with online, text, display ads, elevator screen media, bus sides and traffic sponsorship channels. 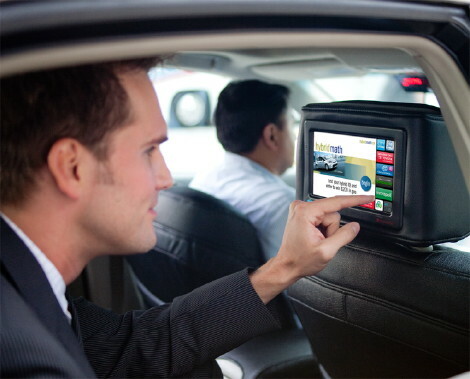 Play Taxi Media is a Canadian-based media company that has operated since 2008, offering interactive and measurable digital media solutions for Out-of-Home and Mobile advertising. Play’s platform delivers direct campaign ROI results with the ability to track every consumer interaction on the network. “We are able to track everthing, from where the interest is in an ad and how long the interest is held to how many times the ad is seen,” says Williams. This entry was posted on Tuesday, September 4th, 2012 at 11:00 @500 and is filed under DailyDOOH Update. You can follow any responses to this entry through the RSS 2.0 feed. You can leave a response, or trackback from your own site.